I honestly don’t see the problem with the maligned 2015 reboot FANTASTIC FOUR, the dark rendition of Marvel’s longest-running superhero team (first published 1961). Good acting, strong themes (involving family, alienation and teamwork), and an eerie discomfiture surrounding the unearthly “powers” of the protagonists, rather than blind, childish, do-gooder acceptance. And featuring the barbecue-rib guy from HOUSE OF CARDS! This movie has everything! The infected four must adapt to their physical anomalies, with the American military fulfilling its usual boneheaded purpose of trying to weaponize each of them. Their sponsor/mentor is Kevin Spacey’s barbecue maven, Reg E. Cathey, as Dr. Franklin Storm. When the teleporter crashes back into this dimension, Reed finds himself trapped under a girder, which he cannot move off him. He hears Ben screaming for help and crawls toward him. Only his torso is in shot through the smoking rubble, as he painfully drags his body along the ground. When he looks back, he sees his legs have not been freed from under the girder, but are rather “stretched out” along his path. His face contorts in pure horror. He faints. When we see Ben as an orange rock-thing in his cell, his arm is fused to his body and he painfully extricates it. Gravel dust is shaken loose with his exertions. It’s a sad, terrifying ordeal. When Reed asks him about his condition later, “Does it hurt?” Ben replies, “I’m used to it.” Sue drops in and out of visibility, and Johnny is aflame, constantly burning inexplicably… Franklin, though father to Johnny and adopted Sue, considers all the young scientists his “children,” and butts heads with the military over their fate and cure; when he sees Johnny aflame on a table, his face is a mask of suffering, living the pain of his son. We can see the confusion and horror in all these characters as they try to manage their abilities, especially Reed, whose stretching and reshaping is seen as a constant painful struggle of will. Johnny’s fire is also about will, and as he learns his control, he embraces a newfound independence; he is the only one to call the abilities “powers” while Sue calls them “aggressively abnormal physical conditions.” There is a subplot of the father-son rift between he and Franklin, which threatens to subsume the superhero story due to Michael B. Jordan’s magnificence. 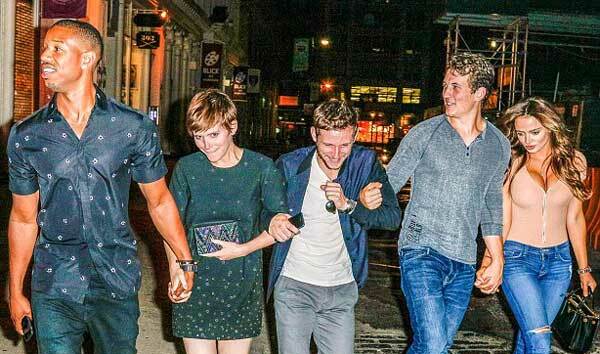 Michael B. Jordan, Kate Mara, Jamie Bell, Miles Teller and girlfriend Keleigh Sperry: The Fantastic Six. No one is given any “superhero names” like Invisible Girl or – heaven forbid – Mr. Fantastic [snigger]. And the “Thing” – due to his rock condition – does not wear any spandex undies. He just gads about naked; he’s just rock hard down there. They don’t even come up with a “team name” until the very end and try ever so hard not to sound corny as hell. For the Fantastic Four in film, this tone has never been adopted before – alien elements intruding upon a dour reality – and it makes this movie an entertaining fantasy, if we drop our expectations for it to be a DARK KNIGHT or AVENGERS. The tone and character reactions override the prosaic plot of Victor returning from the other dimension and wanting to destroy Earth to preserve the environment – HIS dimension’s environment! Doom (who is visualized very creatively, with his atmosphere suit having melded to his skin) is inextricably linked with the other four, due to their powers’ origins, yet he psychologically turned in another direction, and I think the filmmakers missed the opportunity to exploit the trope of the heroes and villain being two sides of the same damaged coin. The vitriol aimed at this film makes me wonder if fans remember that the last filmic incarnation of this team was, in fact, dogshit. Blank-faced Ioan Gruffudd and blanker-brained Jessica Alba as the two main protagonists, with Captain America smug-acting as the Human Torch and Michael Chiklis making a fool of himself wearing disco pants over his naked orangeness. You remember that, dummies? How can you compare the snide childishness of those films with the somber darkness of this one? Writers: Jeremy Slater, Simon Kinberg, Josh Trank, Stan Lee, Jack Kirby. Music: Marco Beltrami, Philip Glass. Starring: Miles Teller, Michael B. Jordan, Kate Mara, Jamie Bell, Toby Kebbell, Reg E. Cathey, Tim Blake Nelson, Dan Castellaneta, Owen Judge, Evan Hannemann. Matter can neither be created nor destroyed. Nor nerd-gasmed. This First Law of Thermodynamics means no new matter or energy can appear anywhere in the universe, nor can any matter or energy be annihilated from this universe. The teleporter in FANTASTIC FOUR travels to another dimension, which effectively means it is leaving our universe. But how is it going and returning without displacing anything? When it disappears – i.e. displaces its matter – other matter should RUSH TO FILL THE SPACE IT VACATED in this universe. That is what would theoretically make the universe implode upon itself. Within a nano-nanosecond, the whole universe would rush to fill voids created constantly by itself rushing to fill the void of the original matter. Before thought signals can electrically send the messages to your brain that you’ve destroyed existence, existence would be destroyed. The concept of “destroying the universe” is mentioned briefly by one of the characters, but that’s in the finale when Doom creates a portal to drag Earth into his dimension (Lord knows why – to copy the plot of other films like AVENGERS or TRANSFORMERS?). As usual, physics is only adhered to when convenient. Or heaven forbid the audience thinks the filmmakers are nerds. At one point, the teleporter returns from the other dimension, and brings with it a shockwave that wipes out the city’s electricity. At least that’s a start toward understanding the implications – as matter is suddenly shoved into our spacetime and other matter must move outwards to accommodate it. But most of the time, the filmmakers display zero understanding of their teleporter’s ability to destroy the universe, as it continues to come and go without the universe even sustaining a small cut on its knee. New age fairies telling age-old tales. Superhero tales have become the folk tales, the Grimm’s fairy tales of this generation. They keep being retold in different permutations. Like all fantasies that revolve around a moral center (Robin Hood, Aesop’s Fables, The King James Bible), they have entered the cultural consciousness and we have stopped questioning their veracity. We barely blink when a super being arrives from another world, when a freak accident causes a woman to become telekinetic, or allows a man to control fire; we yawn when a mutated gene allows for teleportation or superspeed or growing back limbs. Superhero tales – like the agrarian moral tales of old – have become the cultural benchmarks of our age, like the Rapunzels, Snow Whites, Pinocchios, and Peter Pans of a past age. The old tales (Hansel and Gretel, Red Riding Hood, Jack and the Beanstalk, et al) will fade against the might of media employed to promulgate these new age fairy tales. 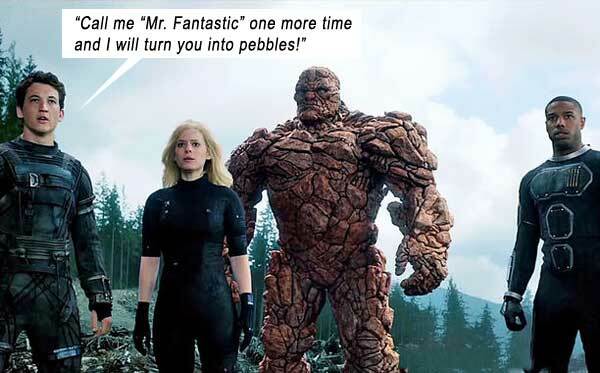 This tale of the Fantastic Four might have been unsuccessful, commercially and critically, but it subliminally draws on the age-old concept of Earth, Fire, Air (the telekinetic, invisible Sue), and Water (the flowing lines of Reed’s stretchiness), so joins the pantheon of elemental tales, universal tropes that add to the synergy of superhero moral lessons in place of the old fantastical tales.